1) Read Meathenge and listen to him when raves about Fatted Calf products. 2) Visit the Fatted Calf website and subscribe to their news letter. They sell different things each week, the newsletter will let you know what is available. 3) If you are lucky enough to live in the Bay Area, get your arse over to Berkeley on a Tuesday or a Saturday where The Fatted Calf is featured at the Berkeley Farmer's Markets. 4)Make sure you arrive there early. Meathenge suggests by 11am at the latest. Don't be lazy, like I was, and arrive at 2pm only to find that The Fatted Calf had already sold out and shut up shop. 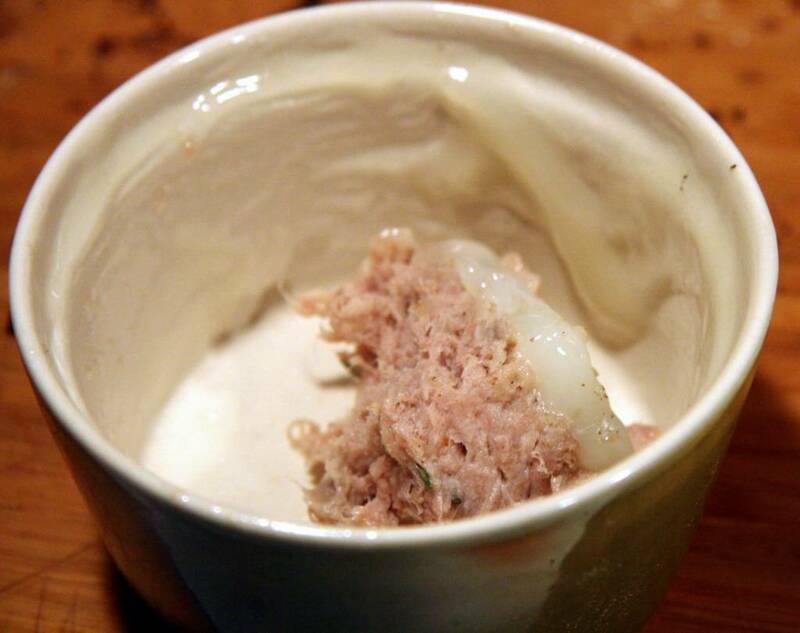 The Duck Rillette was smooth, moist, mild, fatty and creamy. 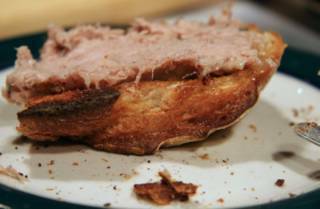 Absolutely delicious spread on toast, with the fat melding into the warmed bread. I loved the Fatted Calf version, whilst those around me preferred the more strongly flavoured pork rillette homemade by a French friend that we were sampling at the same time. The Fatted Calf one definitely had a superior texture, but I must admit the other one had been sitting in the freezer for a very long time. The kind Fatted Calf people, on seeing our disappointment at their not having saucisson sec, popped a complimentary Corsican sausage into our bag of purchases. It was dry, tasty and totally delicious. We started eating it when we got home. A nibble here, a little slice there, it was all gone in about a minute. We immediately kicked ourselves for not trying it whilst still at the market. If we had done so, I think we might have wound up buying the whole jarful. And on to the Boudin Blanc which were stored in the freezer until Wednesday when they were taken out to defrost. On Thursday we opened their white paper packaging to reveal four plump fat sausages. Four seemed a lot, we weren't that hungry. Fred suggest we cook three to share and put the other one in the fridge. I was doubtful that the remaining, solitary sausage would ever get used if we left him in the fridge and decide we should cook all four. One could always be eaten cold, I remarked. "Cold? ", said, Fred, "I can't eat Boudin cold". Anyway, the long and short of it was. 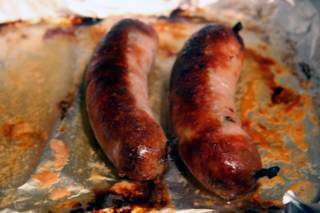 Those meaty, handmade sausages, with soft floury pieces of chestnut were so darned good that, of course, we ate them all, right there and then. Wow! Best sausage I've had since living in the US (3 years, 344 days and counting). Fatted Calf, you have our attention, we'll be back. You excited a fussy, charcuterie-loving Frenchman and he's been raving about you to his French friends. Good job! Good job indeed. Locally, in San Francisco, Bart/Safeway/Singapore Airlines/Wells Fargo and Grant Smith have joined together to send 20 tons of water (enough to quench the thirst of 34,000 people) to Tsunami-stricken areas. Visit this website to see how you can help by making a small donation. "with the fat melding into the warmed bread." You are in need a San Francisco trip!!! Wow thanks for the heads up! I will have to try the Fatted Calf when they come back from vacation. But have you heard of Dittmer's in Mountainview? (http://www.dittmers.com) they have some really nice smoked sausages, hams, bacon etc. really a nice store to visit. Ack, sorry I didn't mention the timing situation. It's second nature to me now. If it's anytime past 11 I won't go, in fact, I try to make it there by 9:50. You're lucky you got some Boudin Blanc, they don't make a lot of it and it goes, FAST. So far, it doesn't seem to matter what they make, it's stellar good. Next time see if he had any of his Duck demi glace or glace de viande, put that on your list. Also put the Sugo de Carne on there, hands down BEST meat sauce I've ever had, ever ever ever. The stuff is so PERFECT all you add is either tomatoes, pasta or just the pasta. No salt or pepper or anything is needed, ever. Put that on your list now. Pester Taylor for the Guinea Fowl terrine, it's a country style pate. I got to taste it while he was experimenting with it. And when it showed up at the market he said, "This time I NAILED it." ooooooooouuuuuuuhhhhhh MmmmMMMM. Okay, the next one might baffle you, but put the Pepperoni on your list. YEAH YEAH, I know. But his is different, a really good different. OH goodness gracious me, I almost forgot to mention the Mortadella. So good that people who don't like mortadella eat it, every time. I get it whenever he has it. One morning some chef came in and bought all he had right before I got there. Probably that sneaky chef from Beowolf, he's quick. I really like the Saturday Berkeley market, it's so low key. Most others are so huge & busy, nobody stops to hang out or lounge around. Don't forget to stop by the Blue Bottle Coffee stand, they roast their own organic coffees, plus they'll drip you a cup right there. Say hi to Kate or Christine, eh. Oh, picked up some apples yesterday that were so good I have no urge for grocery store apples again. Deelightful stuff. I wish I'd got the guys name & farm name, oh well. That's what I git. Glad to hear it went well and glad to hear you'll be going back, it's worth the trip. HUH? I have also heard good things about Berkeley's Cafe Rouge for charcuterie but haven't got round to trying it yet. The Berkeley Market does get busier, but still has plenty of time for chatting and meeting others. So far everyone has been really cool. Cafe Rouge, yeah. You gotta go there. Taylor (Fatted Calf Taylor) worked there as their butcher not too long ago. He developed some of their recipes & processes. Such as the brined pork chops, those are his. Yup, Blue Bottle Coffee has decaf & New Orleans Style iced coffee. Even when it's cold out, it's worth drinking.